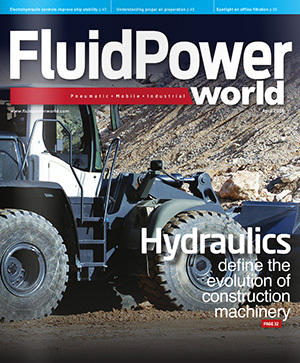 Now hydraulic system designers can handle the most common pressure ranges for their applications selecting from just two different hose styles and a single coupling style from Kurt Hydraulics. For pressure ranges of 3,000 to 6,500 psi, Kurt Tuff and E-Z Bend hydraulic hose along with W-Style couplings provide a “Total Hydraulic Solution,” according to Scott Czupryna, sales manager for Kurt Hydraulics. Answering the needs for today’s lean manufacturers, these two hose styles and one coupling style handle more applications and require less inventory when compared to other industry offerings. Reinforced internally with four spiral layers of high tensile steel wire braid, Kurt Tuff Spiral Flex hose has a very durable oil, ozone and abrasion resistant synthetic outer cover. It has ten times the abrasion resistance compared to standard hose cover, reports Kurt Hydraulics. Impulse tested for up to 1 million cycles, Kurt Tuff Spiral Flex hose withstands temperatures from –40 up to 250°F and meets flame resistant MSHA designation. It meets or exceeds requirements of SAE DIN 20023. For tight applications and down-sized equipment, E-Z Bend Hose has half the bend radius of standard hose for easier routing and more space savings. Providing both greater flexibility and strength, E-Z Bend hose is ideal for today’s mobile hydraulic, compact applications requiring hydraulic hose with tight bend radius using minimal installation force. With a working hose pressure range from 5,000 psi to 6,000 psi, E-Z Bend has a working temperature range of -40 to 212°F and meets flame resistant MSHA designation. Kurt Hydraulics full line of W-Style couplings is compatible with Kurt’s low pressure braided hose and high pressure spiral hose. Handling more applications and requiring less inventory, Kurt W-Style Couplings are designed for non-skive high pressure spiral hose (6,000 psi) and all wire braided hose applications. These couplings are available in 742 different end types.